Send your e-mail with a time delay to congratulate the recipient on time or to hand in documents to the defined deadline. This function is only available to Premium customers. You can write an e-mail now but not send it until later. You can edit the e-mail and adjust the sending time until the e-mail has been sent. Click the clock icon and select when you want to send the e-mail. The e-mail will be stored in your outbox until the chosen time has been reached. 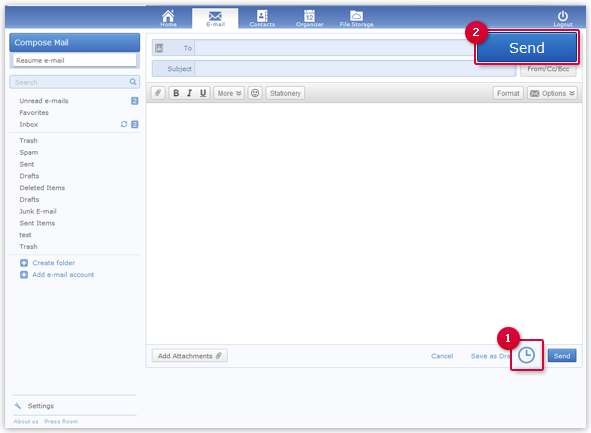 Once the message is sent, it will be moved to the Sent folder. Select the e-mail and click Edit. Click the clock icon and select the new sending time.